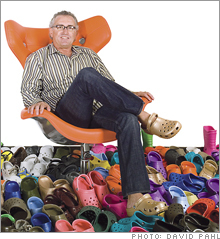 WISHFUL THINKING: Ron Snyder at first thought he'd work a few hours a day when he started working for Crocs. Then people started buying shoes. "They've surprised everybody," says Jim Duffy of Thomas Weisel Partners. "Their replenishment system is unheard-of in the retail footwear space. 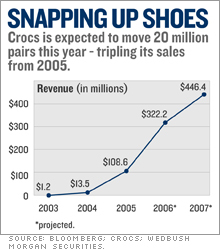 Some analysts say Crocs's biggest issue is that consumers can't always find the colors and styles they want. "As problems go," Duffy says, "that's a pretty darned good one to have." And Snyder has hired a good-looking team: Peter Case, the new CFO, brought management and retail know-how from Ashworth and Guess, while John McCarvel, a vice president from Flextronics, now heads operations. "We hired up everywhere, probably hiring people we couldn't afford," Snyder says. "But you want the right people on the bus early." After all, someday he's going to need that rest. How a stay-at-home mom sold Crocs a $10 million idea.